My mother would often make yogurt for us – none of that nonsense of using low-fat milk, she used good old fashion whole milk. Full fat Greek yogurt comes close and is well worth the calories. My Father had a rhubarb patch in our meadow – the two made a perfect match to celebrate spring. This is the simplest rhubarb recipe and keeps a long time in the refrigerator. 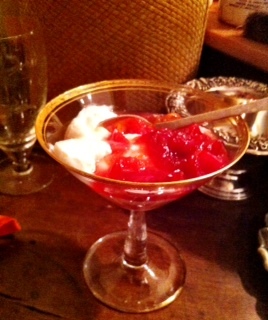 This compote is great folded into cut strawberries as well. look for stalks which have a fair amount of red/pink and are not floppy (which indicates they were picked too long ago). Be sure to avoid the leaves which are toxic. This entry was posted in Recipes and tagged Breakfast, dessert, Greek Yogurt, Rhubarb. Bookmark the permalink. I always like the taste of Greek yogurt. Most of the time i use it as a substitute for sour cream. ,.”,.